This picture shows part of George Gush's collection. 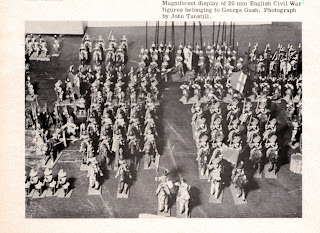 In addition to his well known marathon series on Renaissance Warfare in Airfix Magazine from 1973-75, he had previously (1970) written a six part series on the English Civil War in Miniature Warfare, which will be appearing over on Vintage Wargaming. His other publications included the Airfix Magazine Guide 28: The English Civil War, with Martin Windrow 1973; contributed much of the excellent little Discovering English Civil Wargaming, edited by John Tunstill (1973); WRG rules (1979) for 1420-1700 and army lists (1984); Guide to Wargaming (1980); and Renaissance Armies 1489-1650, based on his Airfix Magazine series (1982). I have some magazines that I would like to sell. Can you tell me the best way to go about it. Is there a collectors club that may be interested. I would appreciate any help you could give me. MW and MS Vol 5 No 11 no date. in general people find collections of wargames mags quite difficult to sell, especially large runs. ebay is always a possibility if you don't mind the hassle - you may find the person that wants that particular issue. I don't think they have any particular value. You could try putting a note on the Old School Wargaming Yahoo group. Equally some readers her might be interested - unfortunately as this is a comment on an old post though I've added a comments widget which would put it on the front page. You also might want to post something on my Vintage Wargaming blog. You list 4 issues I don't have myself -Apr 72, Jul 72, Oct 72 and Vol 5 No 11 which I would be interested in - you can email me using the email link under Contact the Old Metal Detector below.